Making an amigurumi pattern is a lot of work and I really love it. It takes a lot of preparation, concept work, designing and of course crocheting prototype after prototype. There are few things so rewarding as seeing your own design come to life. 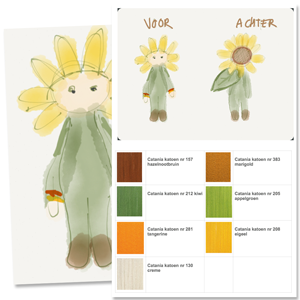 Here you can get a brief idea of the proces that brought Sunflower Sam to life. 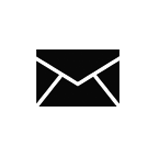 Of course it all starts with an idea. Inspiration can be found everywhere. Even on a refreshing walk in the fields or in a city park. In fact, that is when I get most of my ideas. I love greenery, plants and flowers. 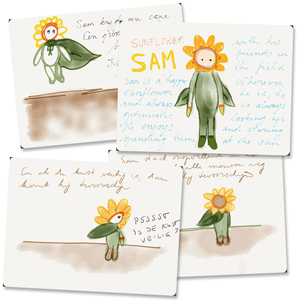 My inspiration for Sam the Sunflower came from wanting to bring a sunflower to life. It had to be a little boy who would have all kind of adventures. Just like little boys in childrens books. Would he be ordinairy? Would he become a superhero? Then all the sketching started to define the concept. 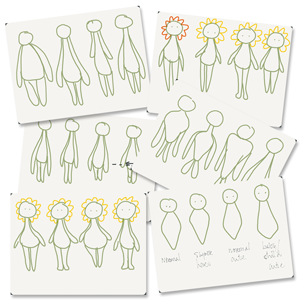 After the concept, I started determining shapes and sizes. What shape does his body needs to be? How long do I want the legs and arms? How wide is his belly and how big is his head? He had to be big enough for children to play with, but at the same time, sketching had to fit on a standard A4 paper size so he turned out about 30cm. Sam has a typical boyish build with influences from a flowerbulb shape. His head is fairly large and significant as is custom in dollmaking and amigurumi. And of course you need to choose a color scheme. As is with sunflowers, that is fairly limited since they are green and yellow. For ease of use I limited myself to standard yarn used for amigurumi that is general available and studied the available colors of that specific yarn type. Now the base colors are decided on. For the doll I added extra nuance and liveliness with the orange rim and cuffs and chose the shades of green and brown carefully. And then comes the hands on part. Translating the doll to a pattern. With gauge in mind you can approximately decide the actual sizes of heights, widths and circumferences of the doll parts. 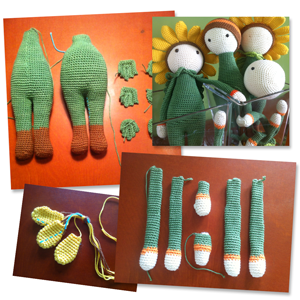 Breaking down the doll into basic amigurumi shapes and calculating stitches and rounds. Writing down the pattern and testing it. Placing increases and decreases to obain a certain shape and changing it. Doing research, trying out stitch calculators and looking for the best way to solve a problem. Making prototype after prototype. Deciding on what works and what does not work. And then again, starting over again with the next prototype untill you are fully satisfied with the end result. And then.. finally.. he comes to life and a new doll is born. It was worth all the effort. 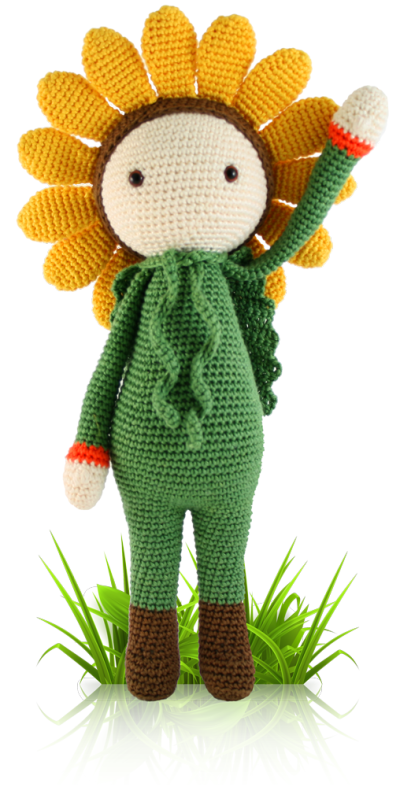 Say hello to Sunflower Sam!